Receive 10% off if you purchase 2 or more! Please Note: Due to FDA regulations, this product is available to residents outside of the USA only. If you have any questions about this, please contact us by calling 1-520-877-2637 between 9am and 3pm Pacific Time Mon-Fri. As an alternative you can check out Body-Care Environmental Defense. You can purchase Body-Care by clicking here. 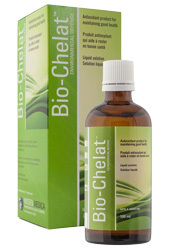 Bio-Chelat™ Environmental Defense, by Nissen Medica, is a German-patented liquid dietary supplement to help support the body's natural detoxification processes. It has no side effects according to the manufacturer, even when taken long-term. Ingredients: per serving - 1 ml (10 drops) - Selenium (as sodium selenite) - 0.004 mg, Sodium Bicarbonate - 3 mg, Sodium EDTA - 2 mg, Potassium (as potassium chloride) - 0.520 mg, Sodium (as sodium chloride) - 0.196 mg, Citric Acid - 3 mg.
Comes in a 100 ml bottle. 1 bottle is approximately a 1 month supply for adults, 2 months for children. Suggested Use: Adults - 1st week, add 5 drops to a 6 oz. glass of spring water and take 3x/day. 2nd week, increase to 10 drops. Use 10-15 drops 3x daily after three weeks. Children (3-12 years) 5-10 drops 3x daily (after 2nd week) in 3 oz. of spring water or organic juice. Babies (0-2 years) 3-5 drops once a day after 2nd week. Caution: Not recommended during pregnancy, breastfeeding, or chemotherapy. 100 ml (3.34 fl oz) Glass Bottle <!--Due to FDA regulations, Bio-Chelat is for sale only for international customers outside of the USA. US visitors, please call 520-877-2637 for more information or email us.